Today’s Dinner with Crayons kid friendly restaurant/cafe review continues my mini-series of cafes within reach of the 2012 London Olympics site. 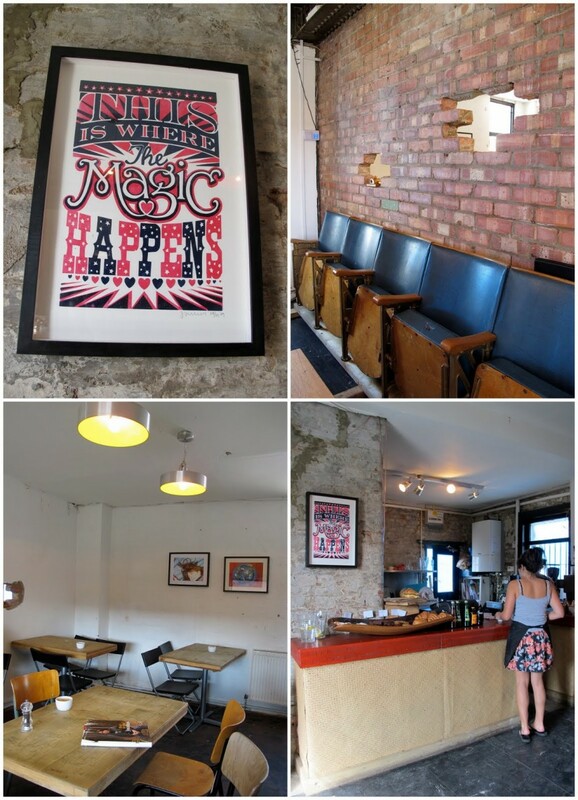 We are visiting The Counter Cafe in Hackney Wick, run by the same team behind The Container Cafe. 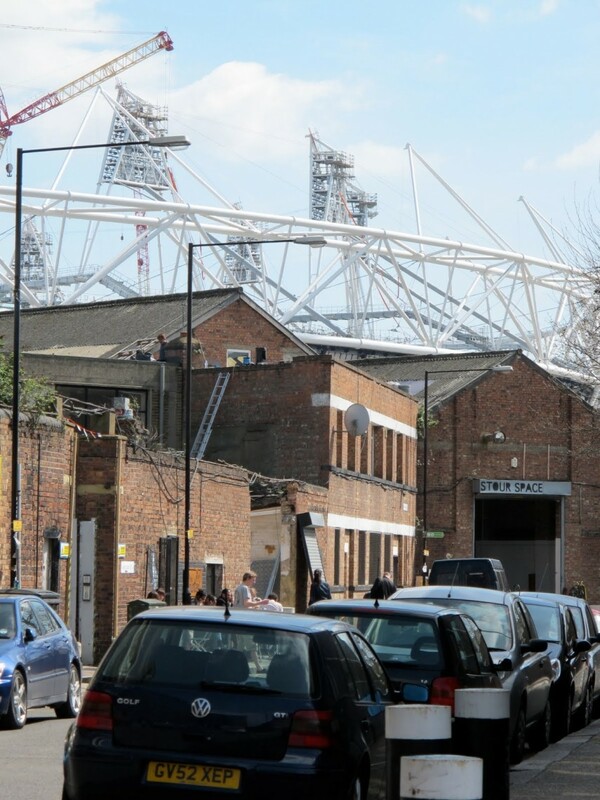 The Counter Cafe is, as you can see above, quite literally in the shadow of the main Olympic stadium. Although the view here is not so good as from it’s sister The Container, as the crow flies, The Counter is arguably nearer. 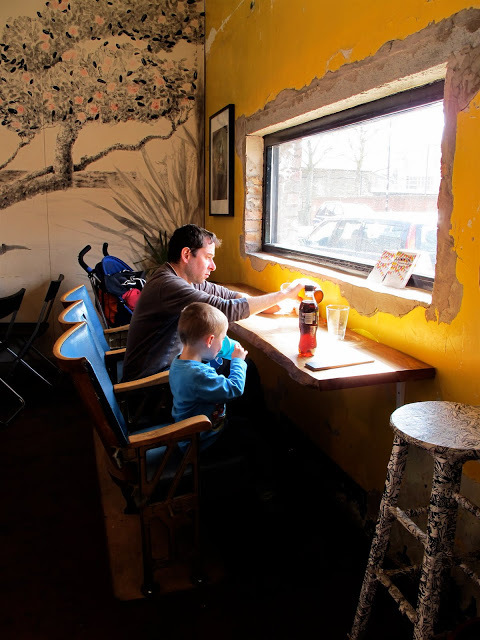 There are four walls, just about, but this is virtually a derelict shack where bare plaster and holes in walls poke fun at the concept of a shabby chic cafe. It’s more fine art student’s flat than Cath Kidston sitting room. Unless you are a crow, or someone in the know, accessing The Counter Cafe can be a tad tricky not least because of the frequent weekend engineering works which often render the nearby Hackney Wick Overground station inoperable at a time when most non-locals are likely to visit. 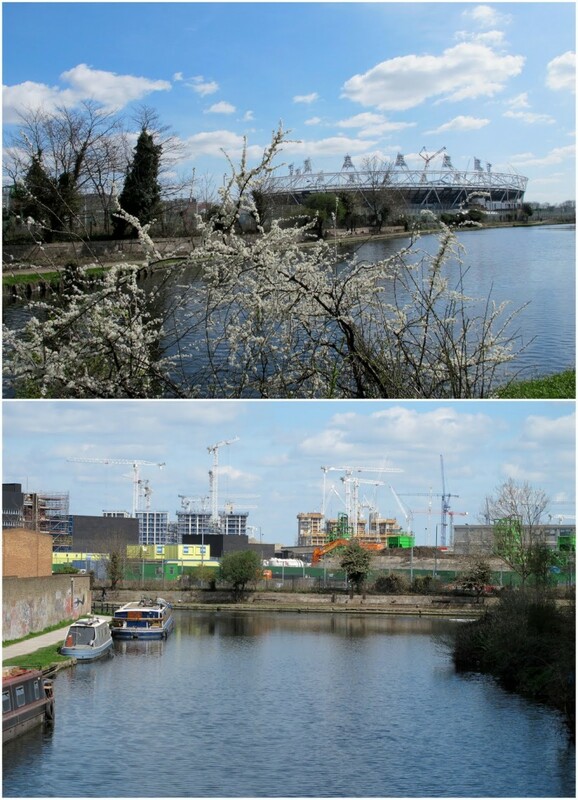 Hackney Wick hides between the elbow of a sharp bend on the A12 in East London and the River Lea. 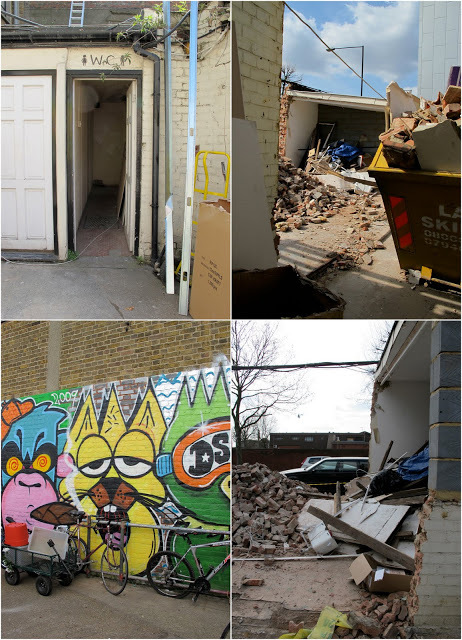 A growing artists’ community renting warehouse space sits cheek by jowl with a council estate and modern waterside flats. The area now has it’s own arts festival too, Hackney Wicked. Seeking out The Counter Cafe, we took a rail replacement bus from Stratford, got dropped off in the middle of what looks like a film set for Life on Mars, nearly put off by some scary Olympic Park Do Not Enter signs (this link initially shows you a google map but then diverts to a Street View shot of the dead end in question) and edged our way down a canal towpath – praying there would be a footbridge across to the other side. 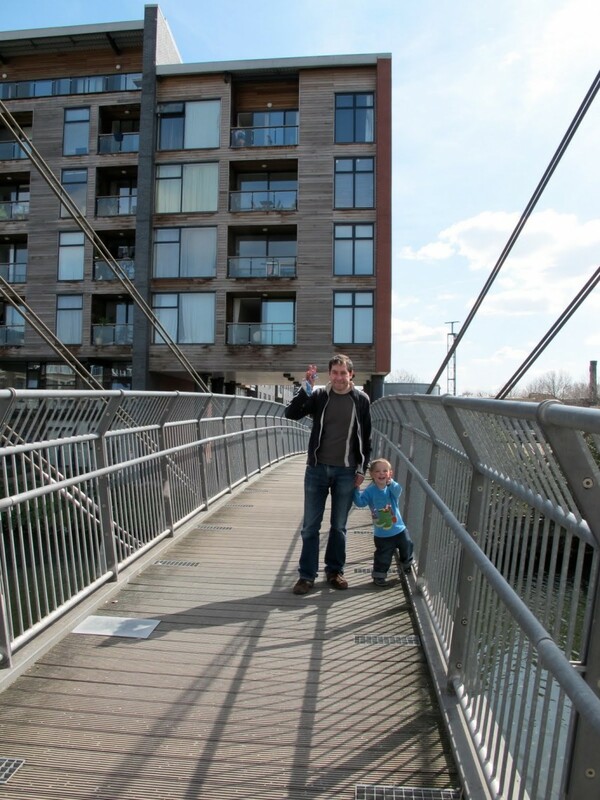 Fortunately there is a footbridge and it was a short hop from the canal to Roach Road, home to The Counter Cafe. Next door is The Stour Space, home to a monthly designers’ market. The area leading to the cafe is a strange combination of upmarket looking flats and scruffy inner city canal backwater. 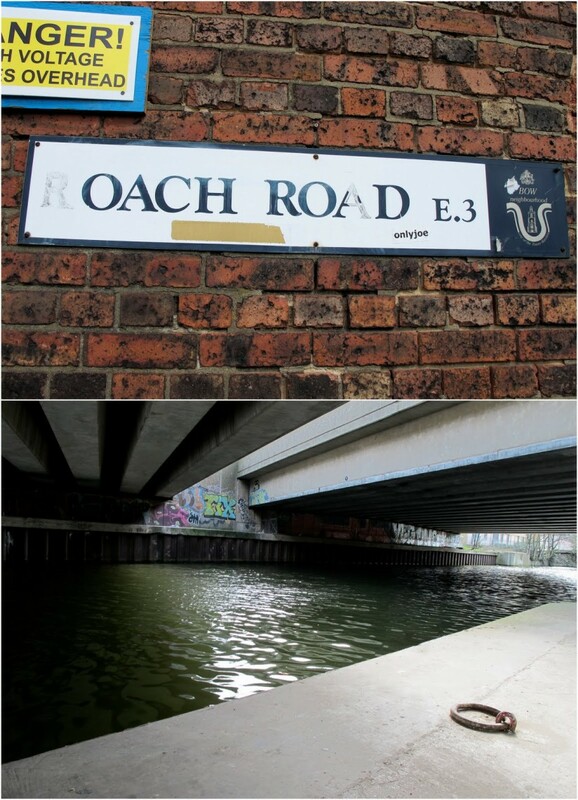 The shot above is underneath the A12 between Hackney Wick bend and the Bow Interchange. The menu consists mostly of brunch dishes, variations on eggs with bacon, eggs with salmon, eggs on their own, you get the idea. This was unfortunate for us since we’d had eggs for breakfast so we prepared to get egged out again. Luckily Ted is crazy about eggs. Although on this sunny Saturday, the outside was teeming with extremely cool twenty-somethings in outfits you used to see in The Face, inside was very quiet with just two cool looking people who were about to have their weekend newspaper reading chill-out disturbed by a toddler who wanted to flip the cinema seating up and down. 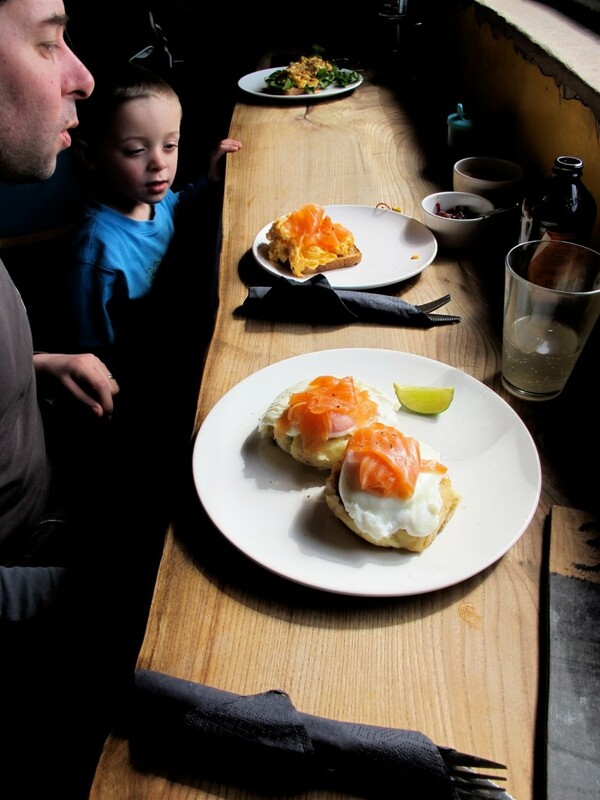 and poached eggs with smoked salmon on potato cakes (bottom). “Mumbai Scramble” – spicy scrambled eggs served with watercress. All three dishes were good quality and value. My Mumbai scramble was pleasingly spicy and a welcome change to the boiled egg I had eaten first thing. There are generous amounts of smoked salmon. Nick enjoyed his potato cakes. 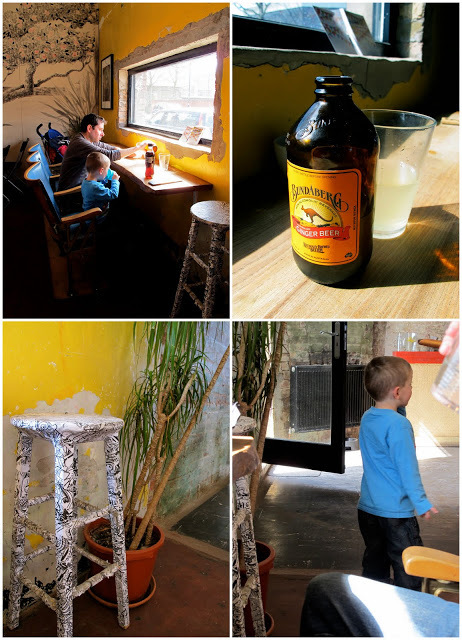 Ginger beer made a refreshing change on the drinks front although I stuck to predictable Coke. For parents with kids who are beyond high chairs and baby changing facilities, The Counter Cafe offers food that will appeal to children and is in a location that offers some interesting walks. We continued on to Victoria Park after seeing the canal and Olympic site. For people with smaller children, The Container Cafe nearby has both better toilet facilities and easier access with a buggy. Arguably the entertainment factor at The Container is better with it’s panoramic view of the Olympic site but Ted got plenty of miles out of flipping that cinema seat at The Counter! I didn’t buy brownies at The Counter but since both business are run by the same people, suspect they’re identical to those sold at The Container (which were extremely good). I didn’t set out to photograph the route from the cafe to the toilet but couldn’t resist. The antiquated dusty toilets are outside (yes you would get wet en route if it rained) in a falling down shed. You walk past urinals with dead plants sitting in them. Still, it is fitting that a cafe right next to probably the world’s biggest building site should have toilets that look like they’re only fit for builders. They’re very scruffy but I’ve seen worse. And the plumbing worked which is more than could be said for The Cadogan Arms. Do I recommend it? Definitely! Badges should be given out so people can prove they found it. It’s worth going on the last Saturday of the month when the designer’s market is on next door. 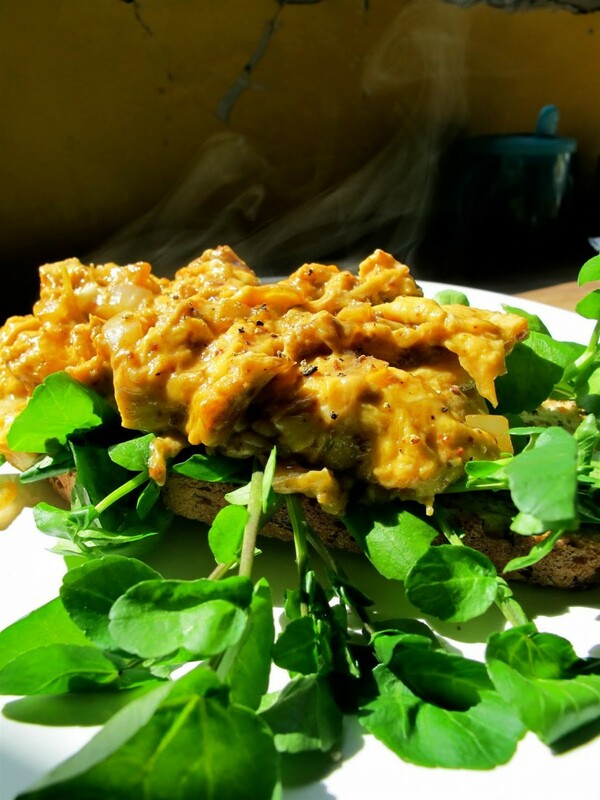 Brunch dishes from £3.50 to £7. Sandwiches and cakes also available. What a delicious looking breakfast, its so nice to see your son and hubby enjoying themselves. What an adorable family you guys are. Hi guys. 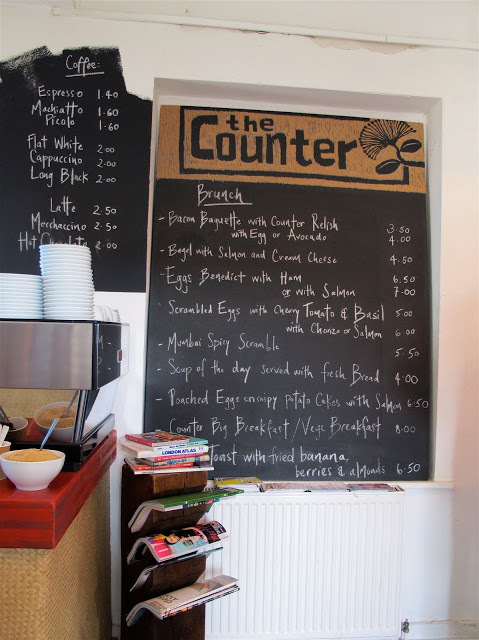 Thought you might be interested to know the Counter Cafe has since moved into Stour Space. So our monthly markets and exhibitions can happen on a more regular basis. Not only that but we have new windows and double doors facing the Olympic site – I think we officially have the best view now! Come for a visit and see the revamped building and extra big Counter Cafe! Love all the beautiful pictures. Ted is so adorable! 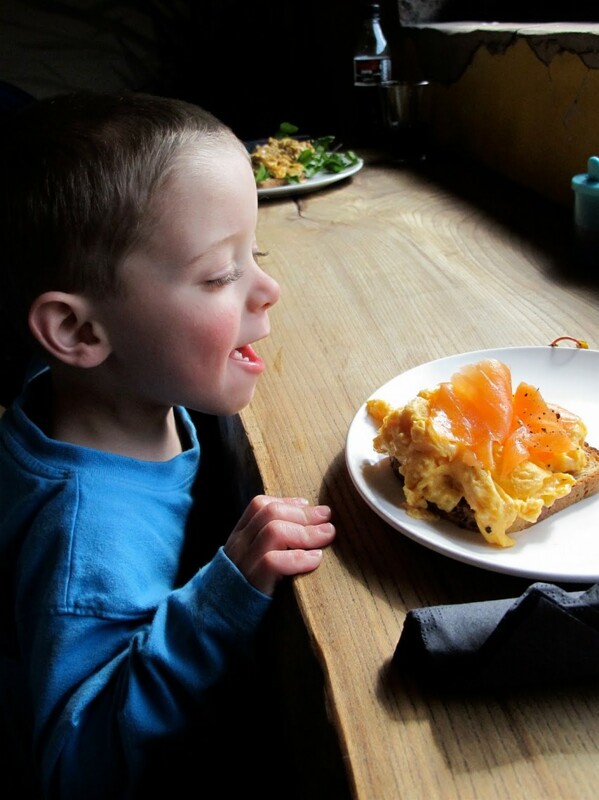 The smoked salmon on scrambled eggs looks great and Ted is so cute! Looks good! What are you using to do your 4 pic mosaics now, are you using Flickr toys or something else? I like em. I will make sure to visit this place after reading your review – I love this new wave of independent/good quality cafes opening across London in the last year or so. The food looks excellent, unfussy and of good quality. Thanks for the review.